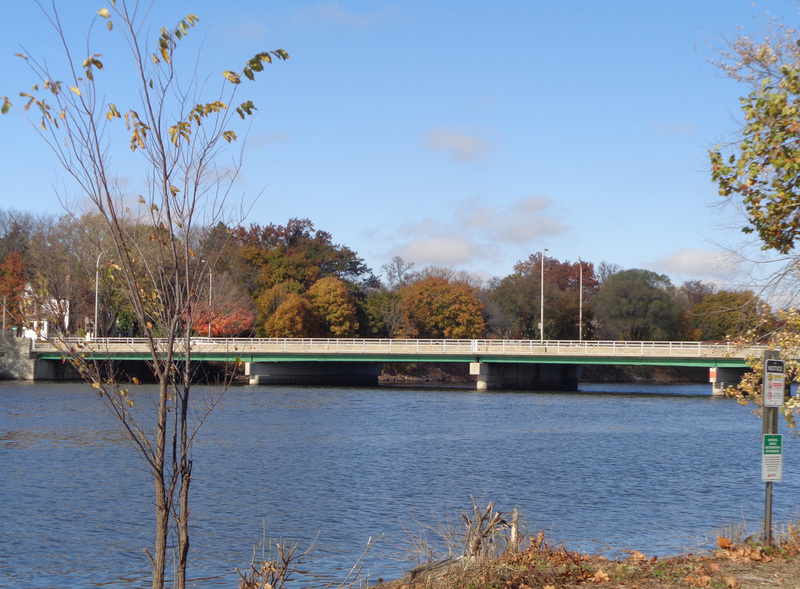 This section does not have pictures of all the bridges that span the Rock River at Rockford. Neither Whitman Street nor Auburn Street bridges are not represented, Nor are bridgs at far north and south ends of the city. Railroad bridges ar not included either. As we find photos of these bridges, we will put them up. 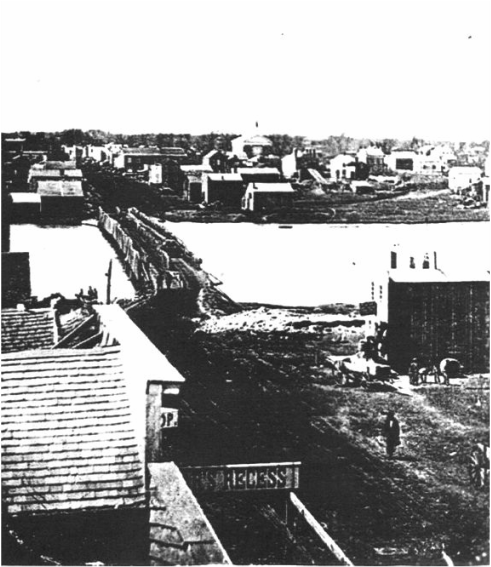 This is the oldest known photo of Rockford taken sometime before the winter of 1853-54 when the bridge was replaced by a covered bridge. The "Rockford House" is on the right. Photograph is looking west at State Street. Built in 1837, the Rockford House was the location for the first Fouth of July celebration in Rockford - 1837. Dinner was served on shingles since crockery was limited. This became the corrner of State and Madison. The bridge was opened on the fourth of July, 1845. 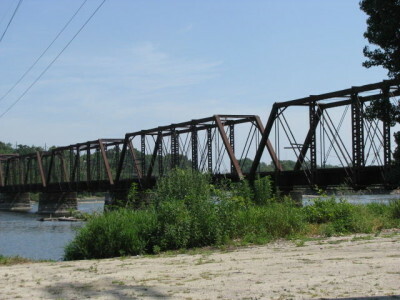 E. L. Potter was the first person to cross the bridge, but the estimate was 2,000 people crossed the bridge that day. This picture is a copy of a drawing of State Street at the covered bridge looking west across the river. This bridge replaced the one in the picturre above. The building on the right with the bay windows is Rockford House again. This drawing probably was done in the 1855. A new bridge was built in 1871. 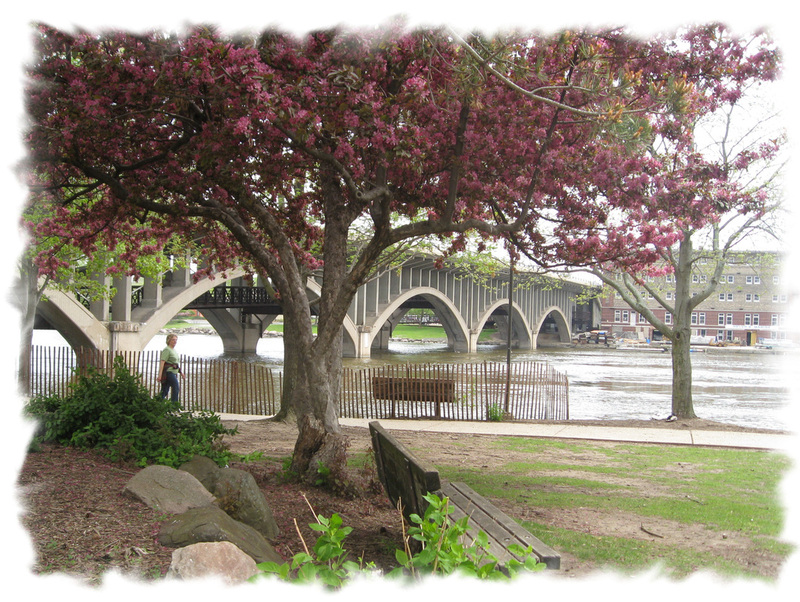 State Street Bridge, known as the Girder Bridge. 1905. looking east. North End Bridge, ca 1913. 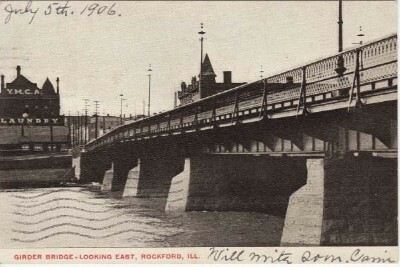 Replaced by Auburn Street Bridge. It was built specifically to allow the steamboats to pass underneath. If you look at the slope of the bridge, you will understand why this bridge might have causd trouble for cars in the winter. Slope was too steep. State Street Bridge, circa 1938. looking west. Chestnut Street Bridge, looking northeast. circa 1930s. State Street Bridge in background. 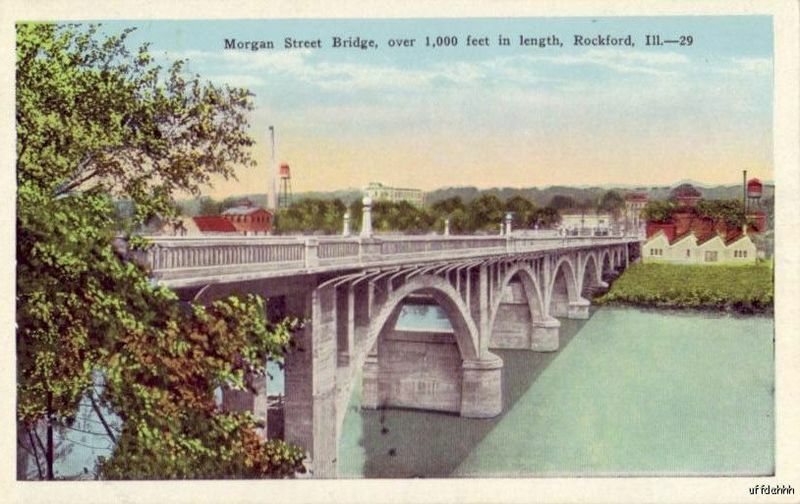 Morgan Street Bridge. Replaced by the one below. Looking west. Newest bridge: Morgan Street bridge under construction in 2014. Nelson Bridge also known as the 15th Ave. river crossing. The bridge was declared unsafe for heavy traffic and closed in 1929. A new bridge was proposed. The Nelson Bridge was reopened in 1930. A new bridge was built and opned in 1934. Anothr view of "north End Bridge" also caled "High Bridge". Jefferson Street Bridge. Looking northwest. circa 2000. Photographer unknown. Foreground bridge is Chestnut Street Bridge, mid-range bridge is State Street Bridge, third bridge is Jefferson Street Bridge. Circa 1950s. 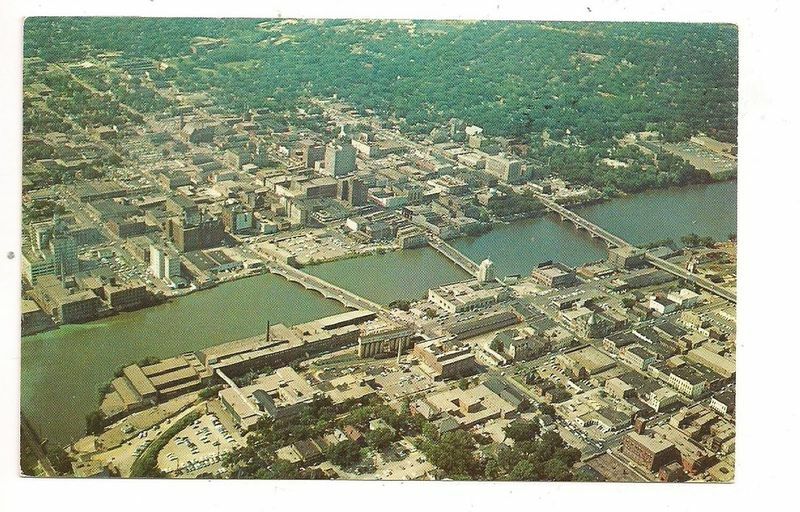 Photo of downtown bridges taken in late 1950s. Nelson Hotel is still standing left of Chestnut Street Bridge.. It was razed in 1960. Auburn Street Bridge. Photo taken 10-30-1015. The high-bridge was further up-river. For awhile, the two bridges existed simultaneously. CHICAGO & NORTHWESTERN (C&NWRR) Bridge, above the dam. Union Pacific Truss Bridge.Just below the dam. This bridge is slated to be turned into a bike and walking bridge across the river.